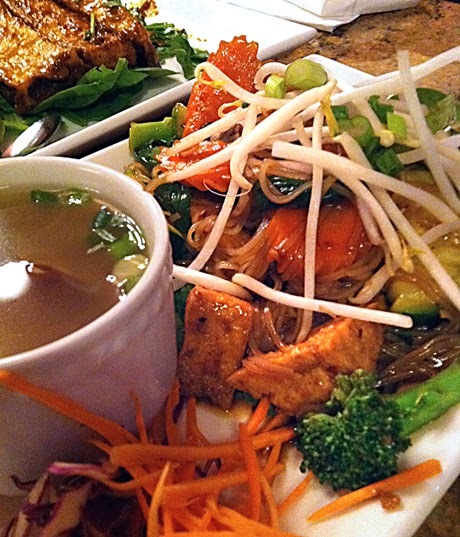 Tofu and veggies over mung bean noodles. 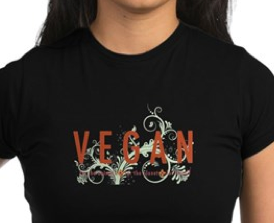 It's the last day of vegan mofo 2013, and this is my post #22. I have a cold, and don't feel like writing much, so I intend to go out in a blaze of bowls. Just imagine most of these bowls having a kick from some form of hot spicy condiment. 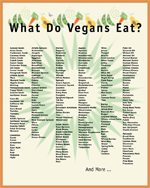 But before I bid adieu and head off to a hot shower, I want to thank my multitudes of fellow vegan bloggers for providing inspired reading and mouthwatering recipes all month. It was a challenge and an pleasure to keep up with you all! Chips, kidney beans, cabbage, carrot and quinoa hot and cold bowl. Warm black beans and veggies over salad bowl — I like a mix of hot and cold foods in a bowl. Believe-it-or-not breakfast bowl. 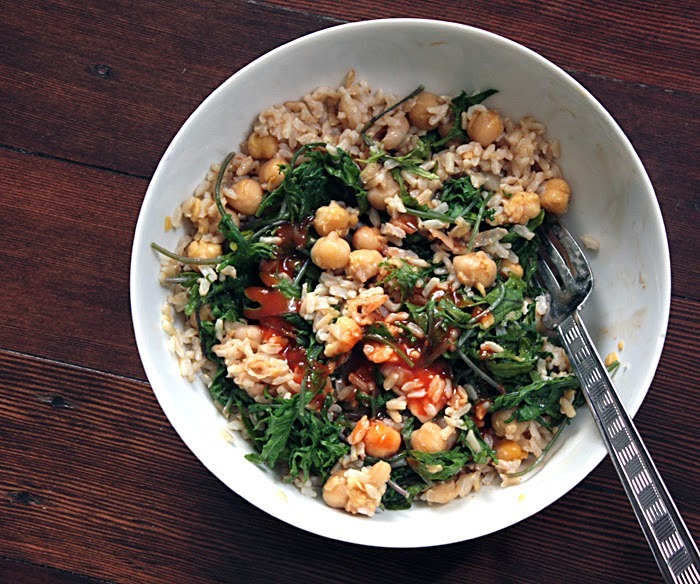 Sometimes sriracha over chickpeas, kale and rice hits the spot in the morning. No measure, no recipe carrot nacho sauce for a tasty nacho salad bowl. 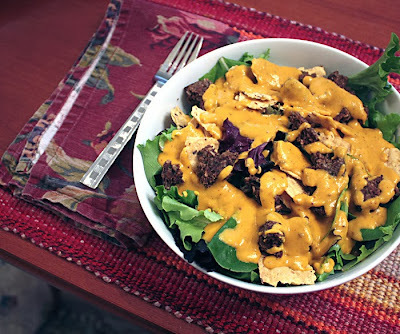 Barbecued soy curls over salad over quinoa bowl. 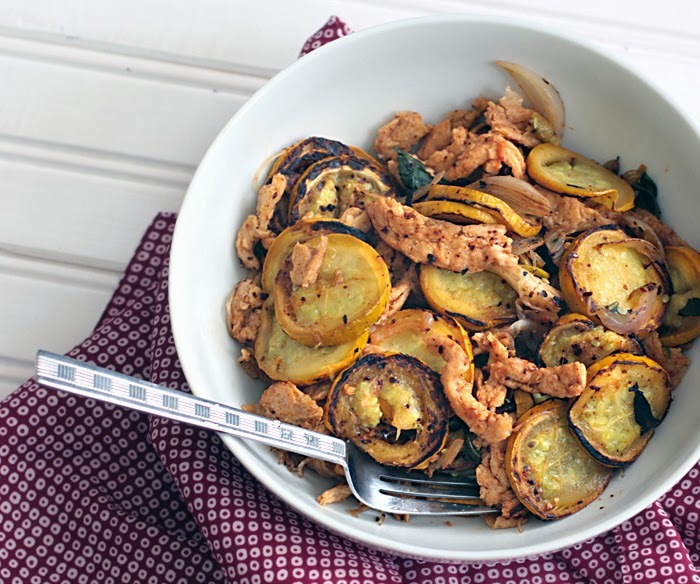 Summer squash and soy curls over mung bean noodles bowl. Last but not least, I'm a little sorry that I don't have a berry bowl to end with in symbolic honor of my "Top 50 vegan blogs of 2013" award from berryripe.com. Thank you berryripe.com for the honor! 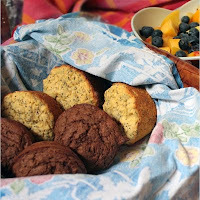 Berryripe.com is a great resource site filled with exciting and healthful vegan recipes, and useful health and fitness information. Whenever I read about people being scammed, I wonder how they could have been tricked. Why didn't they see the signs? How could they be so naive? This is how. When I get letters like this I look at them for a minute, wish they were real, then add them to the recycling bin. When the letter above arrived, and my husband saw it, I told him I'd already received a couple of others and was going to recycle it, but he was annoyed that we were getting so many letters, and proceeded to call customer service at Delta Airlines. We usually fly Delta, and he wanted to know if they had any connection to this. The Delta representative checked it out, called the number, and told Ken it was for real, and we would be given two tickets if we participated. My husband was on board (so to speak) and asked me to call the number on the letter. I was skeptical but I did it anyway, and was told that a large travel company was considering opening an office in Seattle, and was doing some preliminary marketing to see if a move here made sense. We would have to listen to a presentation and then we would get our tickets. "THIS IS NOT A TIMESHARE," he said. "This is a legitimate travel agency." The only available slot he had that would fit our schedule was at 5:30 the same evening in Bellevue — a nearby city just over the bridge. "We could go out to dinner afterwards," we said. We showed up to the appointment 15 minutes early as requested, and were asked to show ID and fill out a questionnaire, while we sat, along with a bunch of other couples, in a row of chairs. Eventually, each couple was invited to a large room filled with small round tables, where we met briefly with a personal representative. Let's call our guy 'Brad'. Brad engaged us in friendly (as in fake friendly) conversation about himself, us and our travel habits. I would say he was semi-enthusiastic. He explained a little about the company, assured us it was not a time share or other scam, then he left, and the main event started. We watched a powerpoint presentation about traveling around the world, and staying in wonderful hotels, resorts, bed and breakfasts, etc.We learned they were selling memberships in a travel club where we would have access to a personal concierge who would save us bundles of money for rooms, cruises, international airfare (but not domestic airfare) etc., etc. He explained the huge markups in travel costs and how they were able to save us 30 to 40% of normal costs. All this for a one-time-only $12,995 membership fee, $300 one-time-only activation fee and $299 annual fee. Seriously. What a deal, huh? On this night only, though, because we were the first in the area to be involved, our costs would be much less — $9,995, $300, $199. Beam me up, Scotty. I looked around the room. The group covered a wide range of age, ethnicity and style. One couple seemed entirely normal and pleasant, except they owned three timeshares, and I feared they would soon be members of a scam travel club. The speaker used classic humor tugs to make people feel special and included. It seemed to be working particularly well on one young couple, the male of which clearly felt he was hipper than everyone else. I was growing more and more uncomfortable. Finally, the presentation ended, and Brad came back to our table. We chatted. He kept asking me if I had any questions and I kept saying no, but I should have asked if his conscience ever bothered him. Finally, Ken told him that as a researcher, he couldn't commit to anything without checking it out first. Brad said he understood, and that the travel club had a A+ rating with the Better Business Bureau. He could set it up so we could come back the next day for the same price. Um, no thanks. Brad suddenly said he'd get us our ticket vouchers so we could be on our way, and he left the room. He was gone for at least five minutes, and it was really weird and uncomfortable. Everyone else in the room was engaged in animated conversation and we were just left there. When he finally returned he handed us the voucher, pointed out the "rules" and said we could leave. I was in a terrible mood. Not only did we feel scammed, we felt rudely scammed. Even though I knew Brad dismissed us because he knew we weren't going to be fooled into joining, I was very distressed by the procedure. And I also felt bad that I hadn't done anything to call the company out in front of the others. Why hadn't I asked the right kind of questions? I was in such a funk I couldn't contribute to a decision on where to eat dinner so our default restaurant ended up being Arraya's Vegetarian Place — vegan Thai. Turned out to be a good choice, and we had a great meal. What better food to order to squelch an evil mood than something deep fried, and when the deep fried food is brussels sprouts, you don't even have to feel guilty. (Maybe a little guilty.) 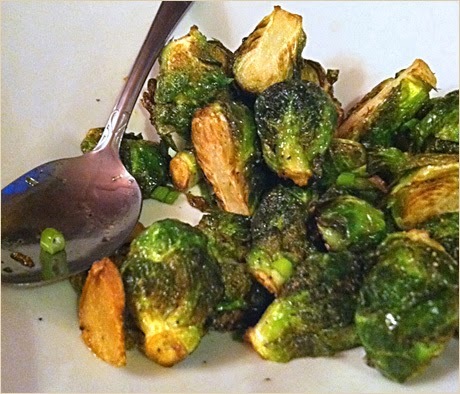 The Brussels sprouts were fantastic — perfectly crisp and a little salty — and as I munched them I could feel my mood lifting. Sad to say I didn't have my camera with me and my phone was unequal to capturing the beauty of the sprouts. 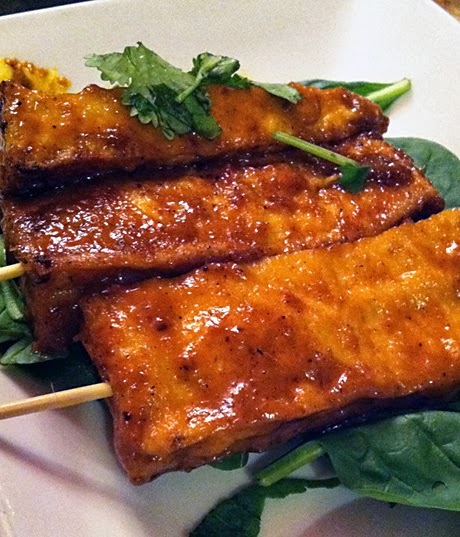 Next came the tofu satay, and after one of these saucy delights, my mood was back to normal, and I wasn't even tired anymore. The tofu was both crispy and succulent. 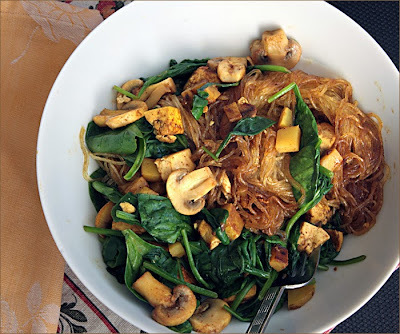 My husband wanted tofu and noodles, which sounded terribly boring to me, but was actually delicious. It came with a small cup of soup, which he happily ate. The East Side Arraya's consistently serves up better food than the one near our house, I'm sad to say. 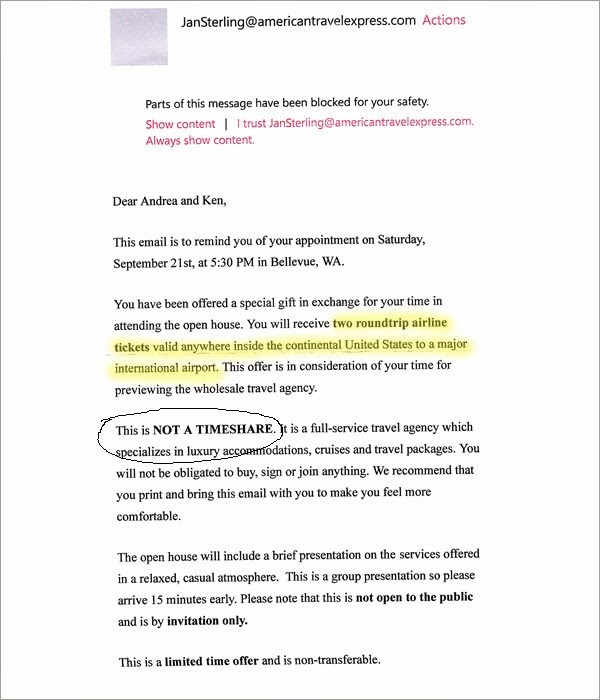 By the time we got home we were feeling pretty good — until we started doing research into the companies we had just dealt with, and read the fine print on the 'free tickets' letter and brochure. If you feel you have been contacted by anyone representing themselves to be from RSI or affiliated with RSI for any of the items listed above, or you have any other questions about RSI and how we do business, please feel free to click the ‘Contact Us’ button below and one of our friendly staff will be happy to assist you. What they do is contract with other companies like DV 365 to do their dirty work. They even have a DV 365 Web page as an example of how they 'help' partner businesses make money. All the companies seem to blame the other when complaints surface. It's hard to unravel exactly how it works — I could go on and on but you get the idea, I'm sure. As for the 'free tickets', they are basically useless. We were told upfront there would be certain fees associated with the tickets — airline fees, airport fees and taxes. We figured even if the tickets cost us $100 each, it would still be cheaper than buying the tickets we wanted. There are so many processing fees and restrictions, including undisclosed fee amounts, that we would never attempt to redeem them. We read stories online of people ending up paying more for their 'free' tickets than it would have cost to buy them outright, with travel restrictions being so severe that the tickets were virtually only usable 32 days per year. 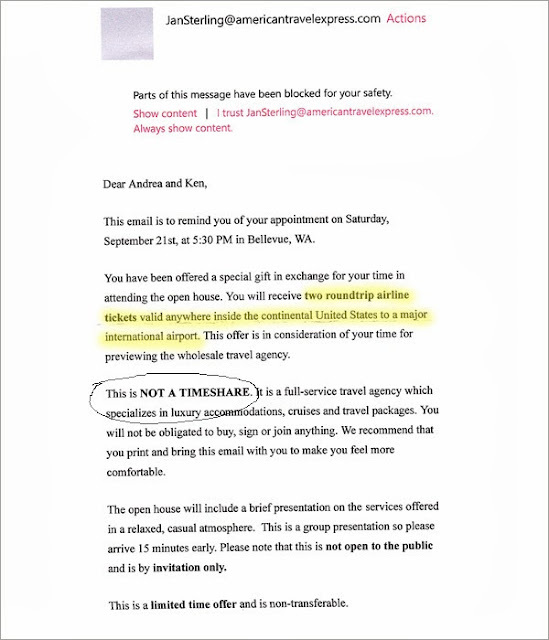 The whole experience confirmed what I knew when I first saw the letter — scam, scam, scam. 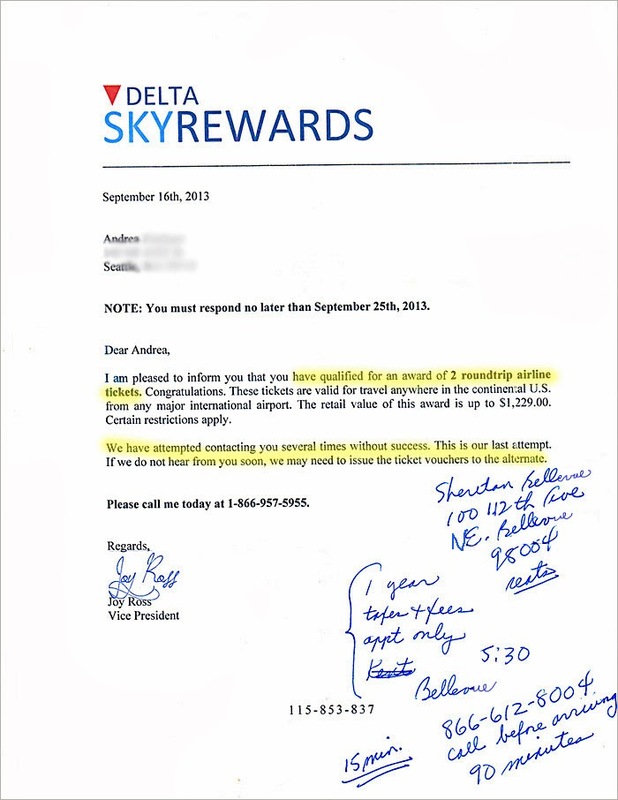 Now we need to see what the %#^@& Delta had in mind when telling us it was legitimate. The old cliché still stands — you don't get something for nothing. 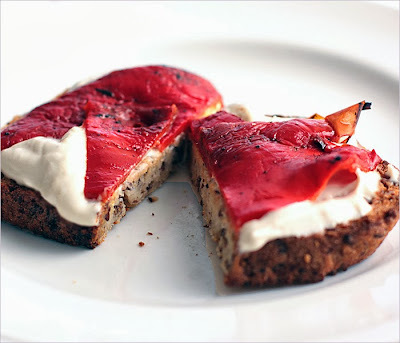 Toasted slice with cashew cheese and roasted red pepper. We recently attended a small, casual dinner that consisted mainly of things spread on bagels. 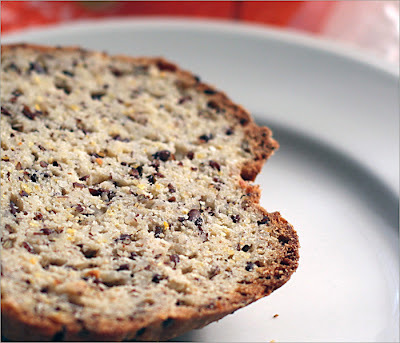 I had a dish to bring from my slow cooker, but at the last minute I decided I wanted a gluten-free bread option to spread stuff on, and asked my husband if he could please pick up a GF bread on his way home. Click to make the nutrition label bigger. The bread he brought home was new to me, and not only was it as hard as a brick, it was as heavy as one, too. I glared. He swore it was the only GF bread at Whole Foods. Ha. 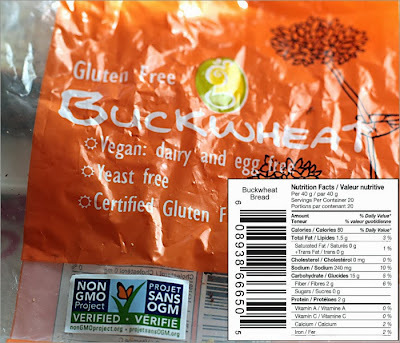 The ingredient list was short — organic buckwheat flour, brown rice flour, organic flax seeds, filtered water, gluten free baking powder, gluten free guar gum, sea salt. 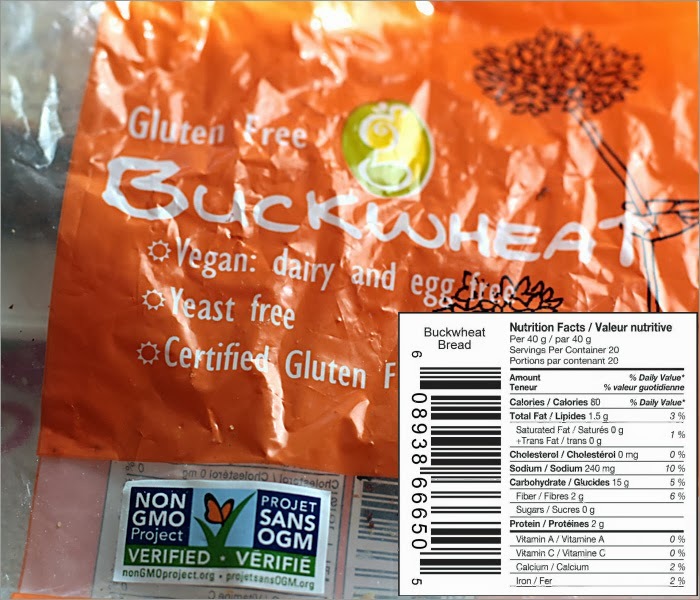 The brand name, which appears obscurely on the back of the package, is GluteNull, and it's made at a bakery in Coquitlam, BC, Canada. In the U.S., it's currently only available in a few places in and near Seattle, one of which is our Whole Foods. Yay. Before we left for the party, I set about slicing the bread in case anyone else wanted some. 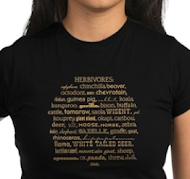 (You can snicker here, if you'd like.) I was surprised to find the cut slice pleasantly soft, moist, and kind of pretty. 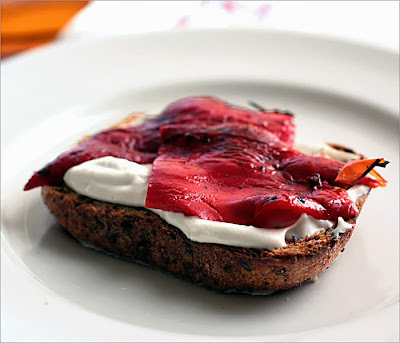 Later, while everyone at the party slathered their bagels, I piled toppings onto my buckwheat bread, and took a bite. The slightly gelatinous texture, thanks to the generous amount of flax seeds, was a little off-putting to me, but I ate it anyway. You know the drill. At home the next day I tried toasting a slice to see if the texture would improve, and yes it did but not enough. So, I toasted it again and voila! It was actually good. Very good. I was munching a slice coated with homemade jam, when I came across a mofo post on Veganosaurus about fermented cashew garlic cheese. It used only cashews, water, salt and garlic, and since I was needing a savory topping for my new favorite, double-toasted toast, I started some cashews soaking. 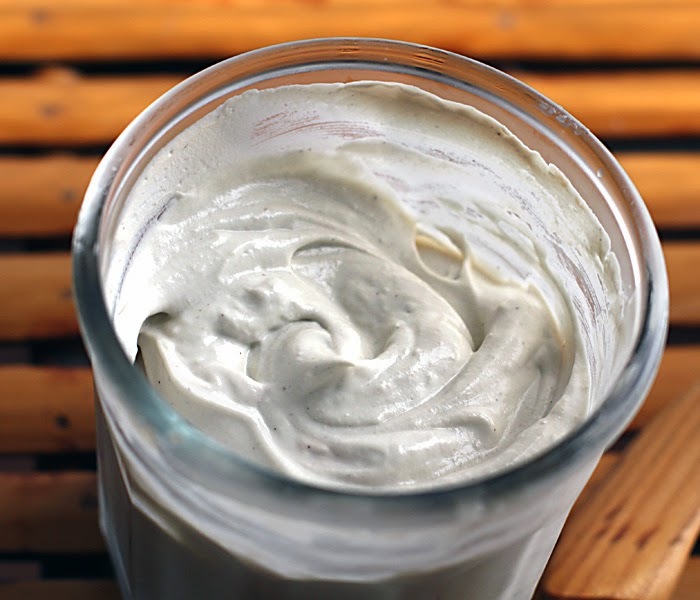 Like all fermented cashew cheeses, it takes a bit of time to reach the eating stage, but it requires very little hands-on time. 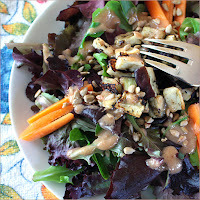 It's very easy.You soak the cashews, drain them, grind them, then set them aside to ferment. It must have been a bit chilly in my kitchen because the fermentation took two days. My cheese turned out soft and creamy like cream cheese — and is delicious. Perhaps if I'd followed the directions more closely, it would be firmer, like Susmitha's. The roasted red peppers, by the way, came from our farmers market. A little pricy, spicy, succulent and smoky, they are hard to resist as we walk by the roaster and breathe in the fragrant aroma. They look pretty fabulous, too, and we are weak. Whenever I go to an Indian restaurant, I take forever to peruse the menu, trying to decide what to order. Everything sounds so enticing. I study the ingredients of one dish after another, imagining the wonderful flavors and aromas, and then I order aloo gobi. Every time. Every single time. I have on occasion tasted other dishes, but the truth is I love aloo gobi best — cauliflower and potatoes in a spicy sauce are perfect companions. If they could just add some chickpeas in there, I'd love it even more. 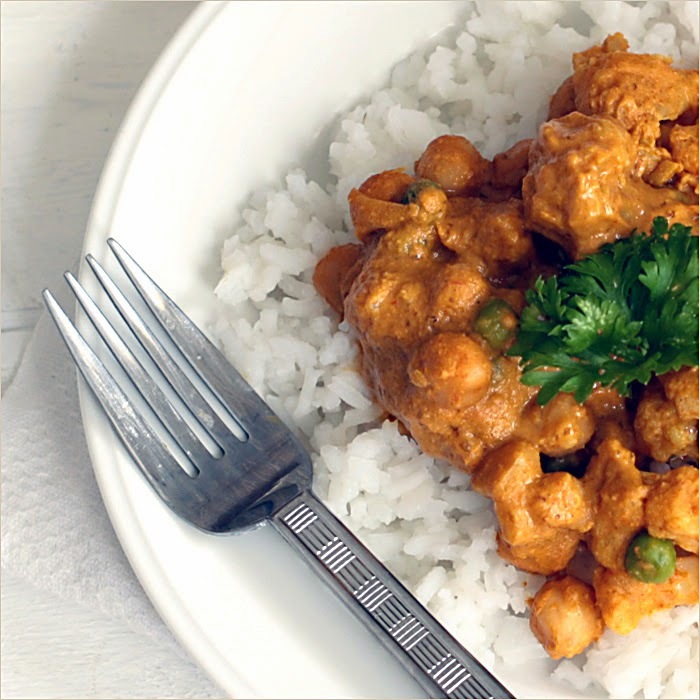 When I cook Indian food at home I'm a little more willing to experiment. I want to try different dishes. But, if I find one that contains cauliflower and/or potatoes, all the better. I saw a delicious-sounding recipe for cauliflower and broccoli with mahkani gravy on Richa's blog. 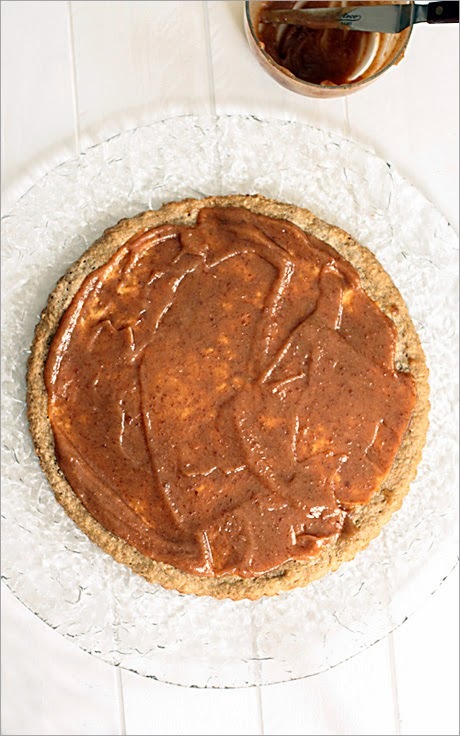 The gravy came from another post she did on a most spectacular-looking whole-cauliflower dish called gobi musallam. The gobi musallam is a centerpiece dish for a special occasion, so I filed it away for a possible Thanksgiving dish, but the cauliflower and broccoli seemed like the perfect thing to make right away. Sadly, my broccoli was decrepit, and had to go to the compost, but I had plenty of cauliflower plus everything else in the recipe, so I made my version with just cauliflower and peas. 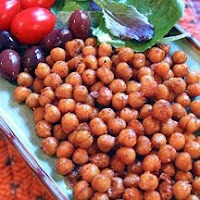 However, since I was in charge of ingredients, I also added my beloved chickpeas. And was it good? Oh, yeah. Go make some. Mofo comes through again with inspiration to spare. Our friend Katrina is a fabulous cook, and we've had many amazing meals with her when we lived in Wisconsin. She is originally from China, and always cooks traditional Chinese food — but a vegan version. She doesn't use recipes so it's hard to get her to tell me exactly how to make a particular dish, but I watched her make spinach and tofu soup, and also got her to describe how she makes cold Chinese noodles. I made the two simple dishes at home and tweaked them to reproduce the flavors we enjoyed at Katrina's house. I've shared both of these recipes before — they are favorites of ours — and I'm sharing them again today. The dishes are both fast and easy to prepare, and perfect for when you don't have much time to cook. The noodles are great as a make-ahead dish when company is coming. The noodles are supposed to have nori, but my husband says he doesn't like nori, and because he made the noodles this time, they have parsley instead. When I make them, they always have nori because it makes them taste extra special. My husband eats them with the nori, so I think what he doesn't like is the idea of nori. He likes the taste just fine. If you want to see more examples of Katrina's cooking, look here and here. 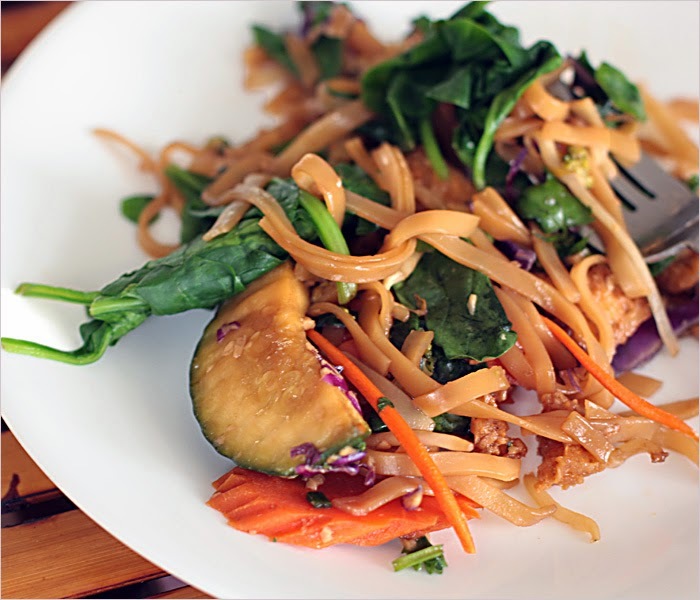 You'll see the noodles with a nori garnish, and so much more. You'll even see Katrina herself! Sauté the ginger in the oil for a minute or two in a four quart pot. I grated my ginger on a microplane grater so it was very fine. 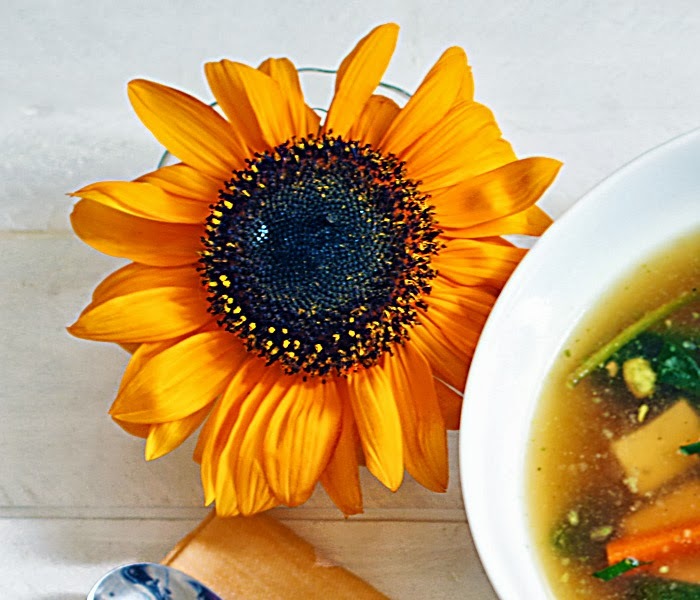 If you are generous with the ginger and grate it fine, the soup will be spicy. Add the water and the tofu and bring to a boil. Boil the tofu for several minutes. Turn the heat to simmer and add the tamari. Stir in the spinach to wilt. Season to taste with salt and pepper. I ground both pink salt and mixed peppercorns. A few grinds was all it took to bring out the flavor. Sauté minced garlic with the ginger. Add grated or match stick carrots with the tofu. Add sliced scallions just before serving. Use low-sodium vegetable stock instead of water. 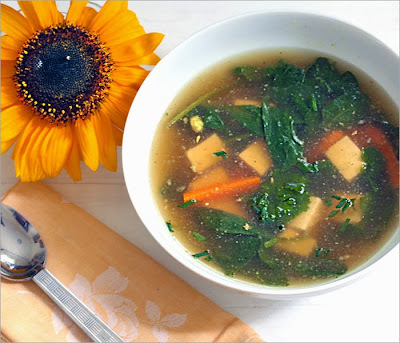 Make miso or mushroom broth to use instead of water. Cook the spaghetti according to package directions al dente. When cooked, drain and rinse under cold running water to cool quickly. Drain noodles again and place in a bowl. Add the oil and toss to coat the noodles. Add vinegar, tamari, chili, garlic, ginger, sugar and pepper, and mix well. Just before serving, add the nori. 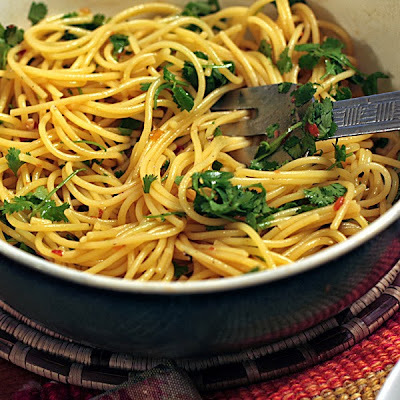 Mix some in and transfer the noodles to a serving bowl. Arrange the remaining nori over the top of the noodles. 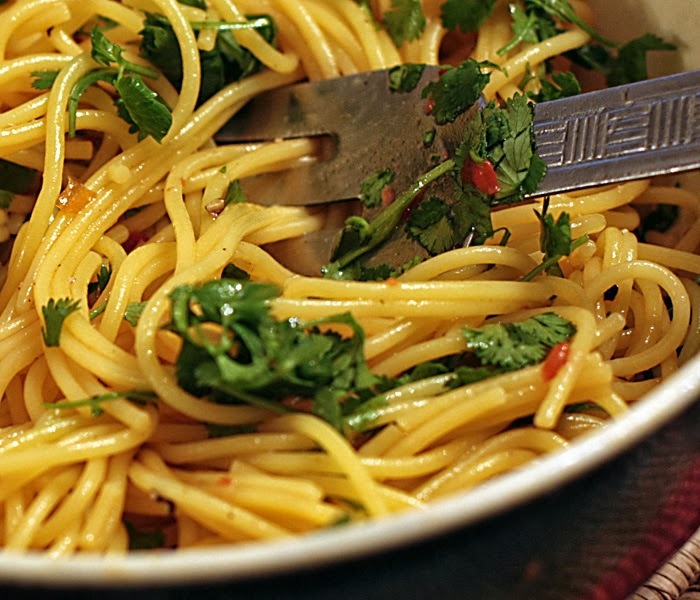 Optional: Sprinkle with chopped cilantro. 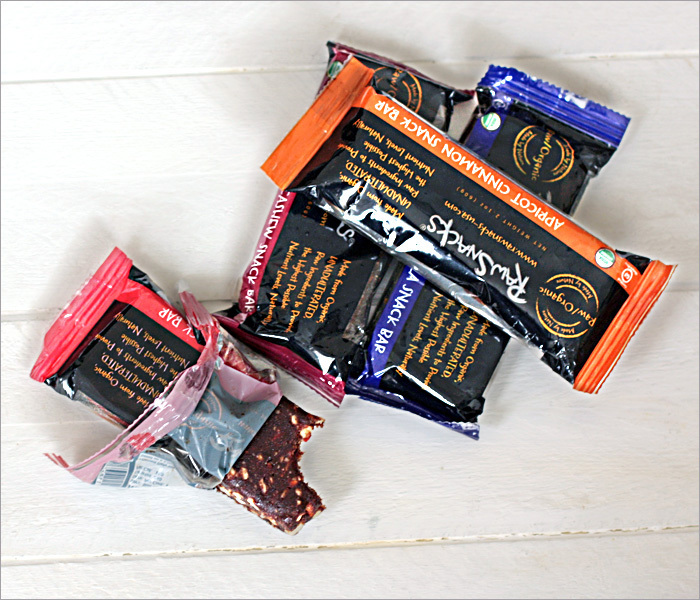 Don't forget to leave a comment on Wednesday's RawSnacks post so you can be entered to win a four-pack of RawSnacks bars. You have until Sept. 30, 2013 to enter. One of my favorite quick meals has many different names, depending on its country of origin. I always thought of it as socca (France), until I saw it referred to as pudla (India). It's also known as farinata (Italy) and cecina (Tuscany). I'm sure there are other names as well. It may be cooked in a pan (non-stick or cast iron) on the stove, or baked in the oven. I've even cooked it in my wok, though I don't recommend that. 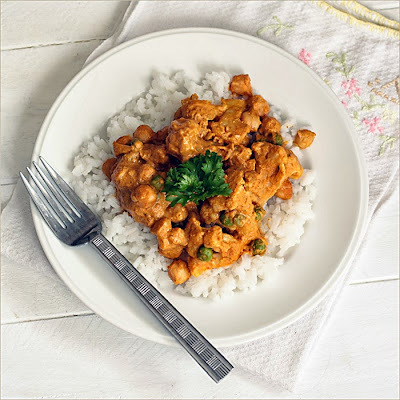 The ingredients are basically chickpea flour, water, oil and salt, the proportions of which vary somewhat, according to the recipe you are following. I've seen recipes with lots of oil, and some with none. 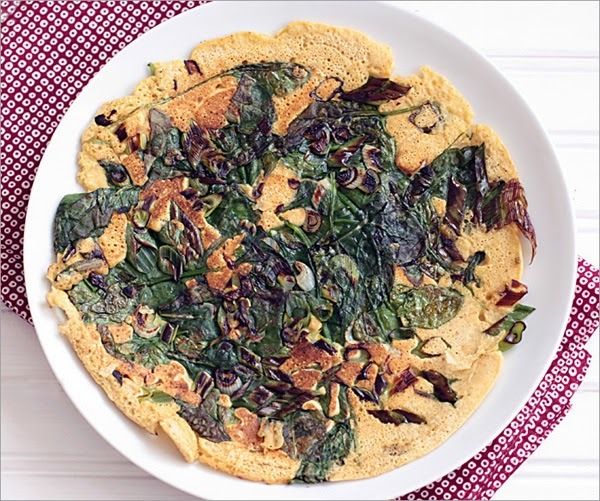 The add-ins also vary a bit — herbs and spices can be added to flavor the pancake to your liking. I've posted about socca a few times, where I've linked to recipes and made suggestions for added veggies. Try here or here, if you want to see some examples. Flipping the pancake in one piece depends on skill and luck, both of which I must have been in possession of the day I made the above socca. 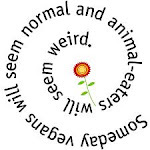 This is not always the case. 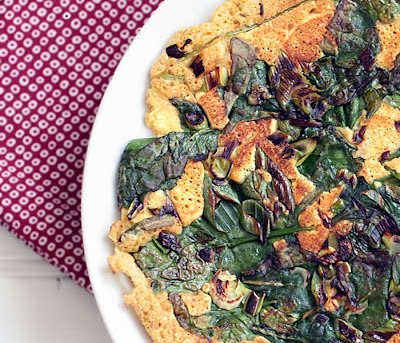 Instead of incorporating the vegetables into the pancake, you can also wait until the pancake is cooked, and stuff cooked veggies inside like an omelet. 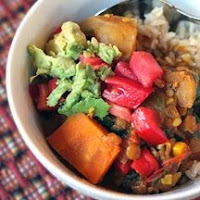 Here's a great recipe to try from Wing It Vegan. Have you tried this? Did you like it? Don't forget to leave a comment on yesterday's RawSnacks post so you can be entered to win a four-pack of RawSnacks bars. You have until Sept. 30, 2013 to enter. When Melisser from Vegan Cuts contacted me to see if I'd be interested in reviewing Raw Snacks snack bars, and hosting a giveaway, of course I said yes. Raw Snacks are a new item at Vegan Cuts, and will be included in the upcoming Snack Box. 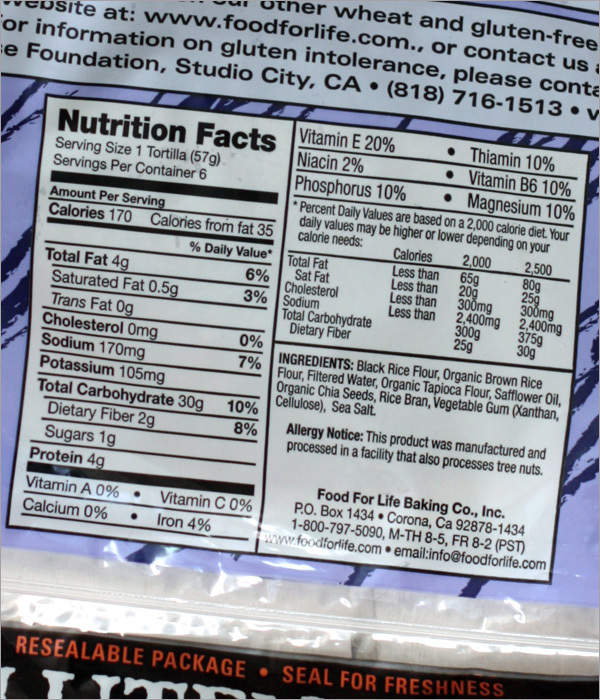 Nutrition facts for the goji-cacao bar. Raw Snacks boasts on their Web site, "We don't even roast our nuts! Raw Snacks is proud to provide certified organic and gluten-free bars packed with high quality ingredients that you can pronounce! Our bars are made without fillers and preservatives, gluten and soy, and are sweetened by a handful of unadulterated ingredients. 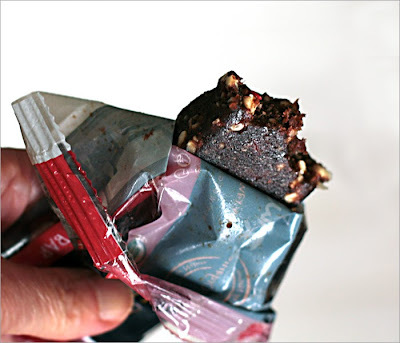 Raw Snacks’ provides the consumer a smart, safe, and guilt-free indulgence or pick-me-up, before or after a workout." Totally raw and vegan, organic, gluten-free and soy-free — Raw Snacks is a bar that meets the preferences of a great many people with special dietary needs. 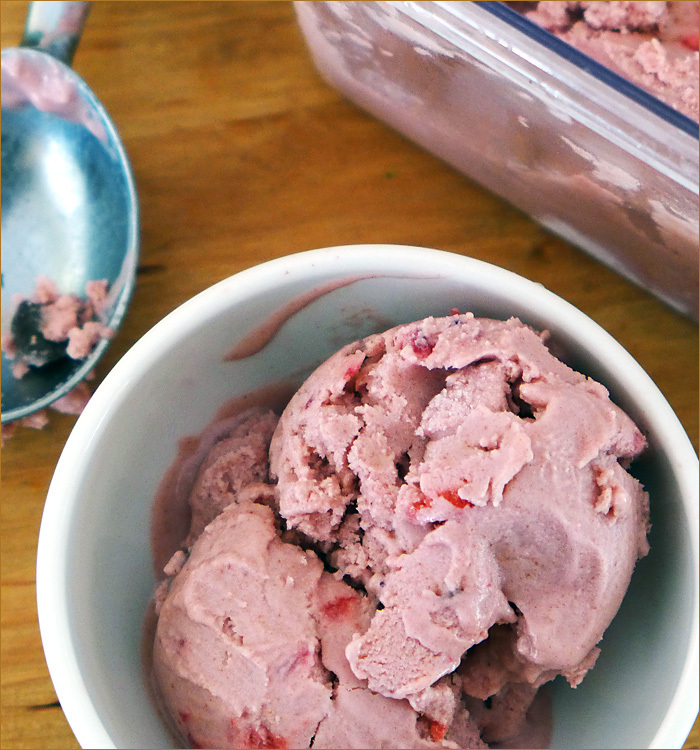 I received four flavors — goji cacao, apricot cinnamon, cranberry cashew, and blueberry vanilla. They all sounded wonderful, but the goji cacao intrigued me the most, so I tasted it first. It reminded me initially of a Larabar, but softer, and with much richer flavors. It tasted very fresh, as if I had just made it myself. I liked it a lot, and would choose it over other fruit and nut bars, because it tastes much better. The goji cacao bar contains 240 calories, 12 grams of fat, and 23 grams of sugar. It also warns on the label that it might contain pit or shell fragments, and yes, it did! I bit down on a couple of hard bits that were unpleasant, but fortunately didn't do any harm. Now I know to be more careful. I haven't tried the other flavors yet, but they all sound delicious, and I plan to take one with me on an upcoming hike. 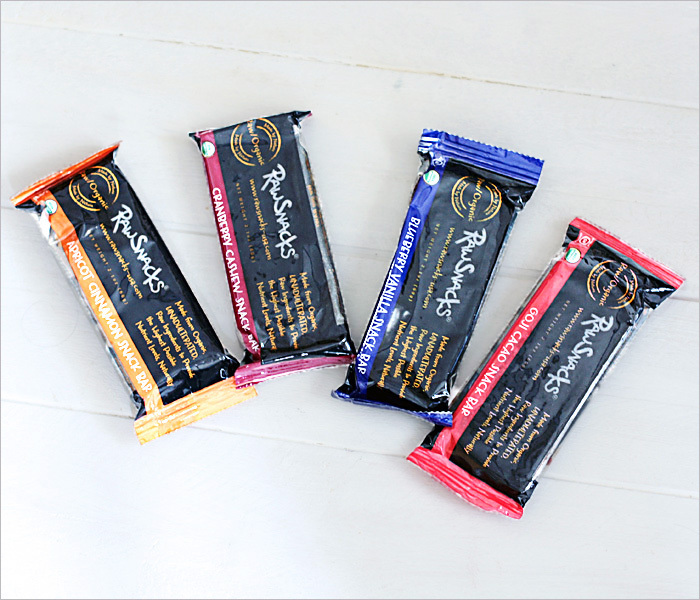 If you're a fan of fruit and nut bars, and would like to try the Raw Snacks bars for yourself, Raw Snacks is offering to send a four-bar assortment to one lucky reader of this blog. 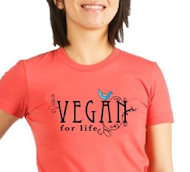 All you have to do is leave a comment, and on Sept. 30, the last day of vegan mofo 2013, I will randomly select a winner. You don't even have to like me on facebook or twitter, or run around the block twice. Just leave a comment and you'll be entered in the giveaway. 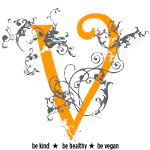 Be sure there's a linkback to your email or blog, so I can reach you. If I can't contact you, you won't be eligible to win. If you just can't wait to see if you're a winner, sign up for the September snack box to try these great bars for yourself! What you're seeing here is an outtake photo that I couldn't resist sharing. 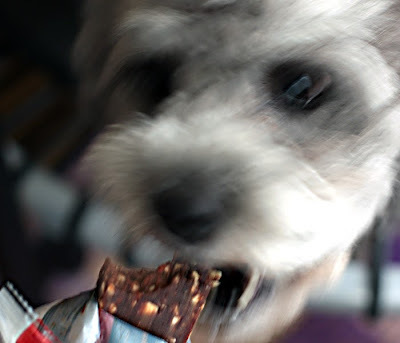 It's a picture of my dog with her mouth open and just about to grab a bite of my goji cacao bar as I was trying to get a photo. I noticed her through the lens just in the nick of time — from my point of view, anyway. She's usually so well-behaved, but I guess the temptation of such a delicious treat was just too much. She must have thought I was holding the bar for her, not the camera. The photo is especially for you, Abby. 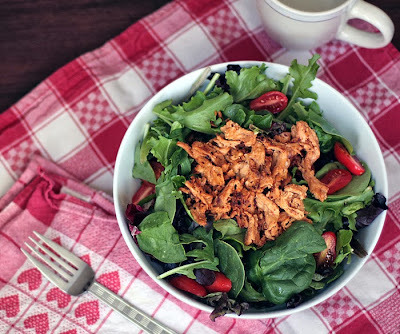 This week I'm posting recipes that have appeared on the blog in the past, and have since become favorite, go-to meals at our house. 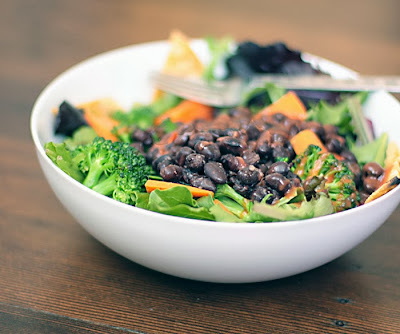 The recipe for smoky black beans first appeared in 2010, as a dish I created on-the-fly to be part of a Mexican cuisine birthday dinner for our middle son. Apparently, I was in the midst of a baking curse, creating sunken cupcakes and "bundt tops," so having the black beans turn out so successfully was probably one of the highlights of my kitchen experience that day. (Don't know what a bundt top is? You can read all about it here.) 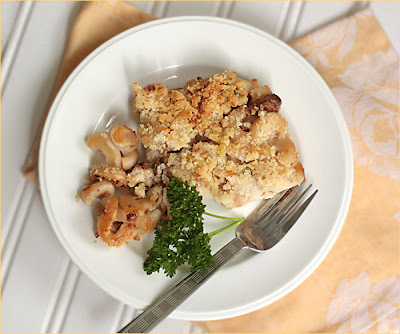 Perhaps you will enjoy this simple but extremely flavorful stove-top casserole as much as we do. Cook the rice, preferably in a rice cooker. The rice should be fairly dry. I cooked brown basmati in a rice cooker with 1-3/4 cups of water. In a large wok or skillet, sauté the onion in the oil . As the onion starts to brown, add the garlic, cumin and oregano and cook for a minute or two until the cumin is toasted and fragrant. (You could also pre-toast the cumin, remove it from the pan, and add it back in at this point. Add the pepper and celery, and cook for two minutes, stirring, until the vegetables start to soften. Add the salt and mix in. Add the rice and toss with the vegetables. Cook for two minutes to flavor the rice. Add the beans and chipotle. Heat until the beans are hot. 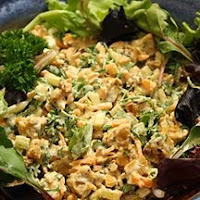 Optional: Stir in 1/2 cup chopped green onions, and cook 30 seconds before serving. Or garnish with raw chopped green onions. Optional garnish #2: thinly sliced red radishes. Generously serves six as a side dish, or four as a main course alongside salad and a vegetable. note: If you want the dish smokey but not spicy, use 1 teaspoon of mild smoked Spanish paprika instead of the chipotle in adobo. A friend sent me a video by Julia Warr that I found very inspirational, so I'm sharing it with you. 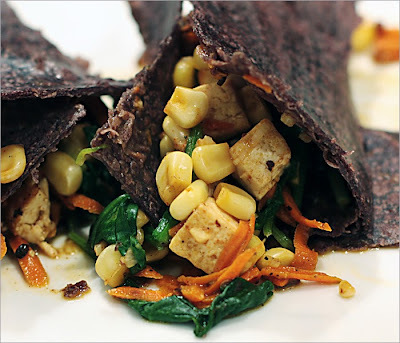 When I was offered a sample of Food for Life's new black rice tortillas to review, I was intrigued. I'd been planning on making my old favorite tofu-and kale-burritos for a mofo post, and the tortillas would fit right into my plan. The deep purplish-black tortillas are not only gluten-free, they are made from black rice, which according to the package, "contains natural anthocyanin antioxidents — just like those found in bleuberries, blackberries, dark cherries and acai." 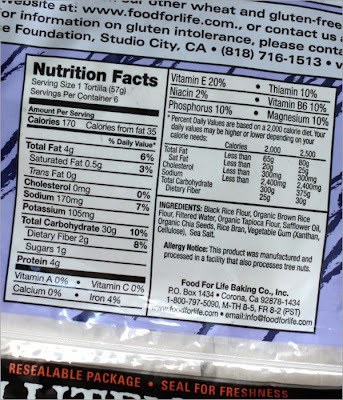 The package also mentions that in addition to antioxidants, the rice is loaded with vitamins, minerals and natural fiber. This is all good, but what about the taste and texture? The package didn't offer any clear directions on how to prepare or use the tortillas other than "to optimize pliability, warm tortilla and serve." For the burritos, I warmed them on a cast iron pan, but you can see from my photo that even warmed, they cracked when I tried to roll them. The tortillas are somewhat thick and stiff, and wouldn't roll without splitting. I've since tried warming them briefly in the microwave between two damp sheets of the separator paper they are packed with, with similar results. The Food for Life Web site has a photo of the tortillas rolled, so maybe there's a learning curve in working with this new product, and I'll eventually figure it out. But, at the moment, I think they would be better served as a flat bread, rather than used to make burritos. I also cut a tortilla into wedges and baked them on a cookie sheet for 10 minutes in a 400˚ oven to create tasty chips that would work well as a snack on their own, or with salsa or other dips. If the tortillas were smaller (they are about nine-inches in diameter), they could probably be baked whole and used for tostados, but I think they might be too big for that. 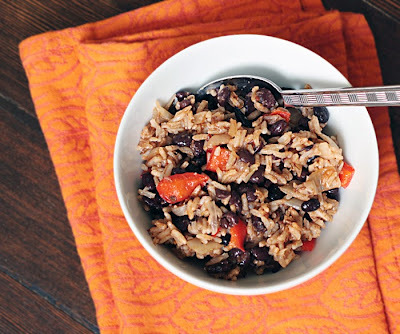 They taste strongly of black rice, which you would expect since that's what they're made of, but it's not as familiar a flavor as corn, wheat or even other forms of rice. We have a bag of black rice in the cupboard that we occasionally cook, so I'm familiar with the flavor, but still found it surprising in a tortilla. 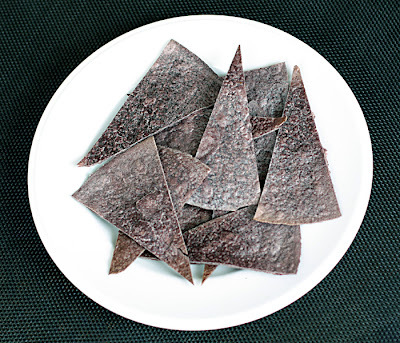 I've served gluten-free tortillas to guests, and they passed perfectly for regular tortillas, but the black rice tortillas require some getting used to, and I would be hesitant to serve them to others. 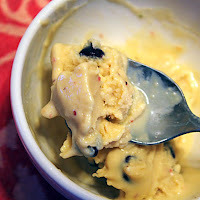 The texture also is unusual as it is at first a little stiff and gummy before breaking down to a slight sandy quality. I would say it's chewy, or toothsome. 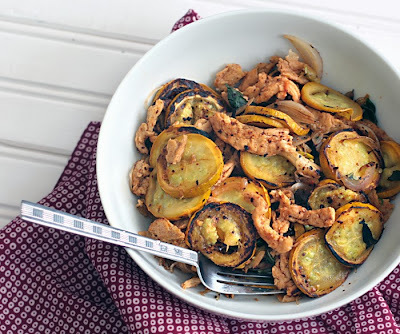 My husband and I enjoyed eating them — we liked the texture and the taste. 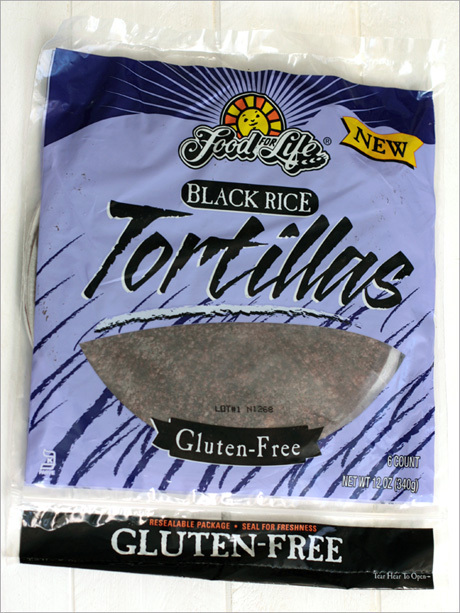 If you're looking for a healthy gluten-free alternative to wheat or corn tortillas, you should give the Food for Life black rice tortillas a try. But if you expect them to taste just like familiar wheat or corn tortillas, you'll be disappointed. If you believe that gluten-free foods can be different, and delicious, the black rice tortillas can add a new taste to your menu. I think they are something that will grow on me. 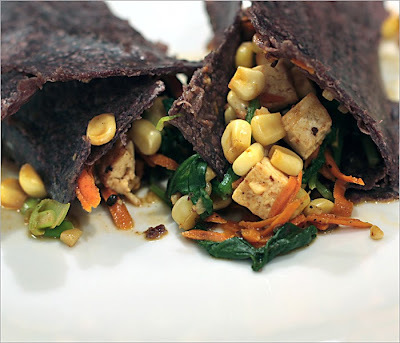 As for the tofu and kale burritos, they first appeared on my blog in 2008. 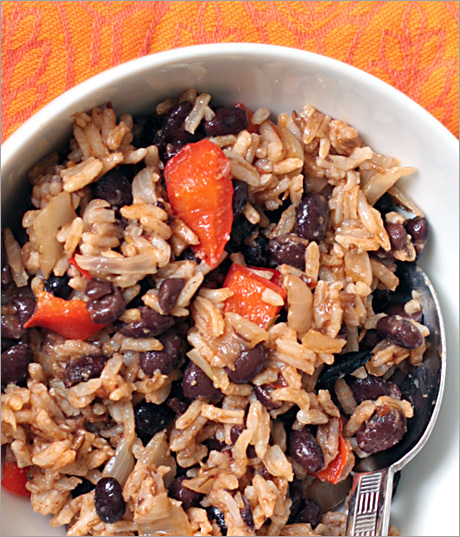 I created the recipe after eating something similar in a Santa Fe restaurant. 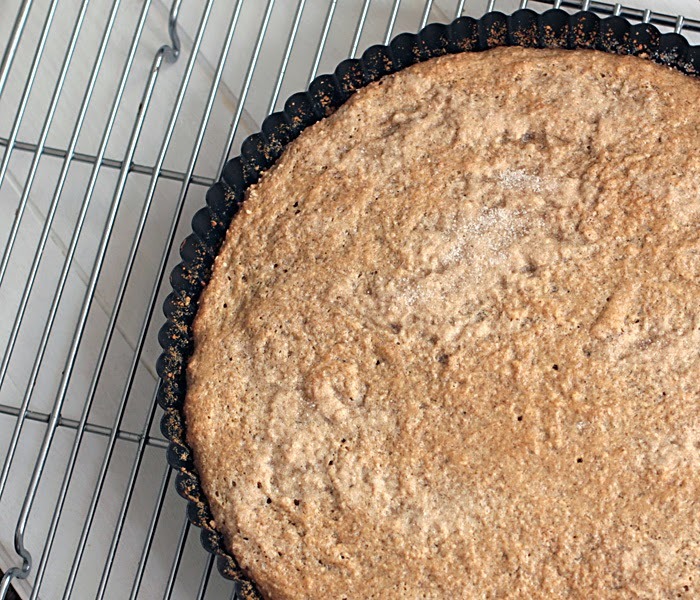 The recipe has become a favorite of ours, and I'm going to share it again with you. In addition to being delicious, it's very fast and easy. It was especially great this time because I was able to use kale from my little pot garden. Makes two to three large burritos. Put the mustard into a glass measuring cup. Add the other ingredients and mix. Add enough water to make about 1/3 cup. Strip the kale from the ribs. 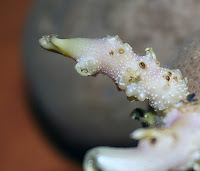 (Hold the stem in one hand with the leaf's underside facing up and just slide the thumb and finger of your other hand firmly along the rib, taking the leaf off as you go. You should end up with a bunch of bare ribs for the compost or soup stock.) Put the leaves in a large bowl of water and swish them around to clean. If the water looks dirty, do it again (and again). Shake off the excess water and mound the leaves on a cutting board so you can shred through them with a knife. Move the leaves a bit and slice some more until they are roughly shredded. Cut the tofu into 1/2-inch cubes and saute with the garlic in a wok or skillet in a small amount of oil until the tofu starts to brown. Add the chipotle and about a tablespoon of sauce and toss and cook a minute longer. Remove tofu from the wok. Add the kale and cover the wok so the kale can steam in the water clinging to it. Turn the heat down a little so it doesn't burn. 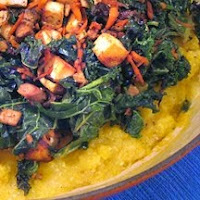 When the kale is nice and tender but still firm (in other words, don't cook it until it turns to mush - just until you can bite it easily — you want to retain some bulk and mouth appeal) grate the carrot directly into the wok and toss in the corn. Cover for a minute to heat the corn and the carrot. The carrot can stay crunchy. Add the tofu, the onion and the rest of the sauce, and flip it all together. note: I love raw onion but it tends to upset my stomach so I add the green onion to the wok just before the tofu is finished cooking, to take the raw edge off. You can add it just before filling the tortillas if you wish. Tortillas: I used to use whole wheat tortillas from Whole Foods or from our co-op, but now I use a gluten-free alternative. Warm them on a nonstick griddle flipping the tortilla until it softens. When it's ready, lay it on a plate, put the filling in, fold in one end and roll it up. Enjoy! Disclosure: The tortillas described in the post were sent to me free of charge. All opinions are my own. The recipe was created by me. This has been a challenging review for me to write. 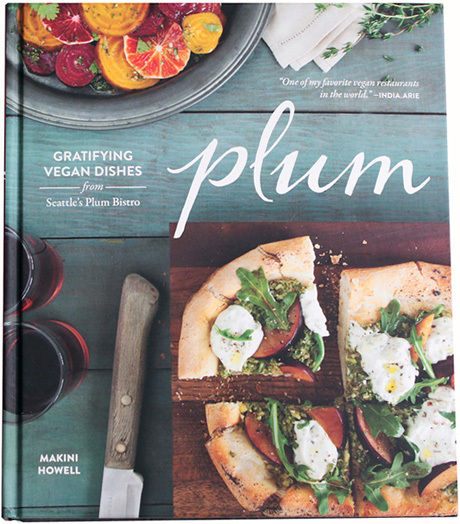 No question Plum, by Makini Howell is a beautiful book — well laid out with lovely photos — but the cooking style is so different from mine that, although I don't want to impose my cooking preferences on my reviews, this one challenged me to the max. 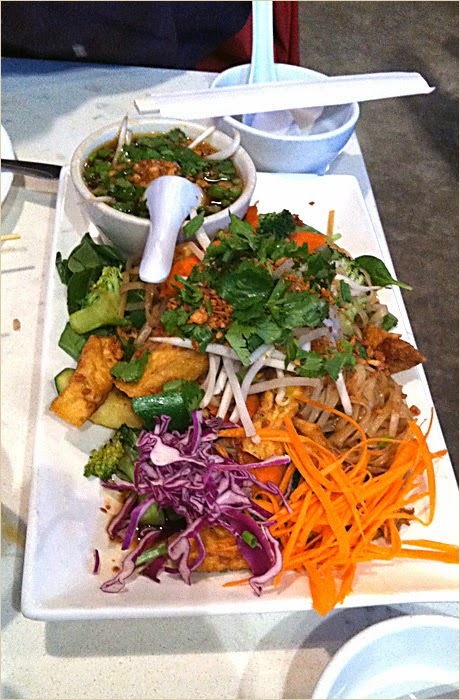 Plum Bistro is a very popular Seattle organic, vegan eatery. 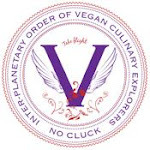 I'd describe it as an upscale comfort food restaurant, and it often appears on lists of the best vegetarian/vegan restaurants in the country. I've eaten there many times, and sometimes I liked my meal and other times I didn't. Sometimes the food was so over-salted and over-seasoned that I could barely eat it, and the last time I was there (for brunch) my meal was totally bland. Sometimes the taste is good, but I feel like I'm consuming a bottle of oil. It's possible to try too hard to replace animal food in a vegan meal, and Plum may be trying a little harder than necessary. 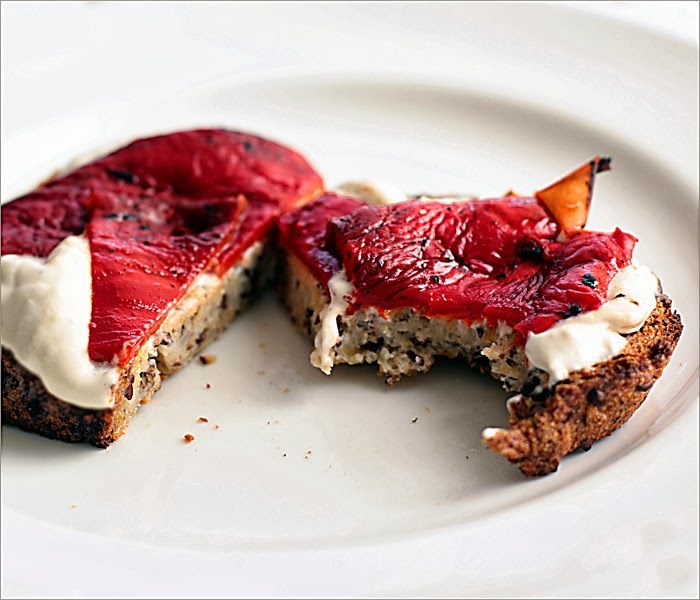 If you've ever dined at Vedge, you'll understand what I mean when I say that Plum is the opposite of Vedge. Vedge glorifies plants, and Plum tries its best to make you forget that you're eating plants. When I looked through the recipes in the Plum cookbook for dishes to try, I found myself balking at the ingredients. I use fat in cooking, and I use high-fat foods like nuts and avocados, but I find it difficult to add 1-1/4 cups of oil to a sauce, or use 1/4 cup of oil in a dish that serves four. OK. That's my speech. 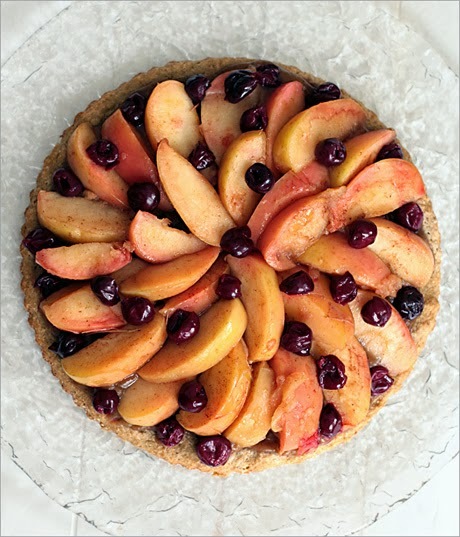 There are plenty of people who will love the Plum cookbook, and I don't want to discourage anyone from giving it a try. Rich foods can be very gratifying on occasion, and you will find lots of options for indulging, here. There are also healthier recipes mixed in among the more extravagant ones, and plenty of interesting cooking ideas to be discovered. And you can always modify recipes to your liking, which I try not to do when I'm reviewing a book. The first recipe we tried was creamy millet corn chowder — one of the easier, healthier dishes in the book. (It only had two tablespoons of oil for four people.) It was pleasant, but not especially memorable. 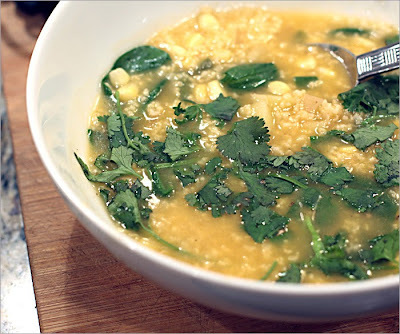 I enjoyed the combination of millet and corn, and it made a simple, light supper. In addition to the millet and corn, it also contained spinach and potatoes, but I was wishing it had had a lot more spinach. The next day, for lunch, I added a couple of fresh tomatoes, lots more spinach and a few peanuts, and I liked it a much better. For our next recipe, I asked my husband to make one of Plum's signature dishes, Plum's Smoky Mac. * (see note below) I was afraid I might not be able to deal with the ingredients, and I knew he would follow the directions. I grated the cheese, made an almond flour substitute for the bread crumb topping, and left. Well, after what seemed like forever, I went to the kitchen to see if I could help. I'd been hearing the sounds of a struggle — crashing pans, frantic scurrying, odd muttering — and began to feel guilty about asking him to make the mac. He was running around like a madman, seeming to dart in several directions at once. The kitchen appeared to have been bombed, and he yelled at me to go away and not bother him. He was almost done, he shrieked. Ha. Some time later I was called to the table where a very large casserole of mac and cheese was placed. I'm not gonna lie and say it was too rich and fatty, and we didn't eat it. It was too rich and fatty but it was insanely delicious, and we gobbled it up like we hadn't eaten in a week. I've even toyed with the idea of making it again sometime for company, but that remains to be seen. 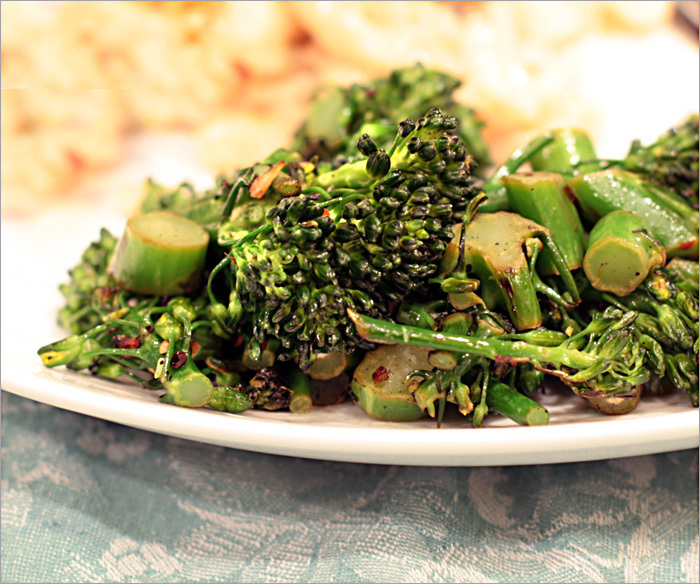 With the mac we had charred broccolini. The photo in the cookbook is much better than mine and makes the dish look very beautiful and appealing, but this was another recipe calling for 1/4 cup of oil to serve four people. If I were to make it again, which I probably won't, I'd reduce the oil to one tablespoon or less. 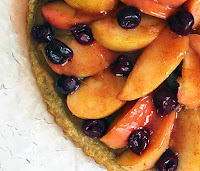 Everyone is looking for something different in a cookbook, and the Plum cookbook may be perfect for you if you like heartier, richer fare that reminds you of the days before you were vegan, if you just want to add some vegan food to your diet, or cook vegan food for omnivore friends. You can see some of the recipes on Amazon if you're interested in learning more about the Plum cookbook. 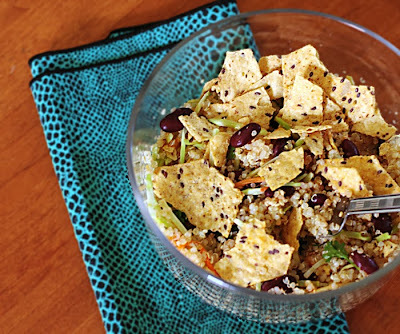 There's a recipe for quinoa-millet cherry salad that looks pretty good. I also want to note that gluten-free recipes are clearly marked. Note: *It's not exactly the same as the mac that people are so crazy about at Plum. That's called Spicy cajun mac 'n' yease. From what I understand, the recipe is secret, and couldn't be shared in the book. 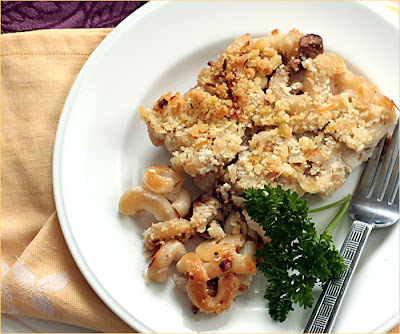 However, the Plum's smoky mac is similar. 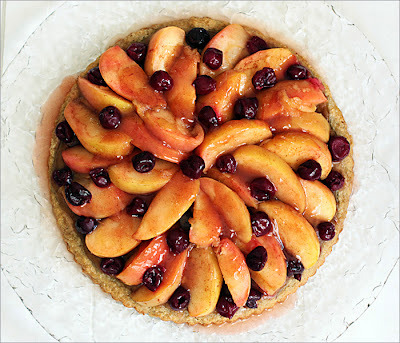 A free copy of the Plum cookbook was sent to me by the publisher. All opinions are my own, but you can probably tell. The post contains Amazon links.